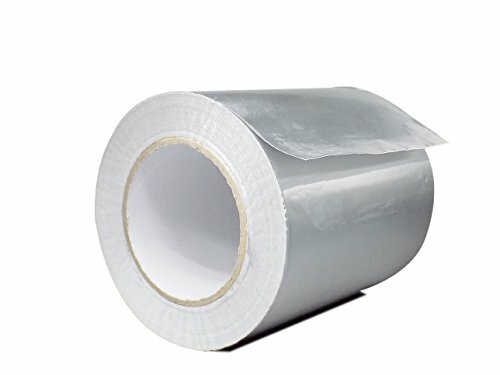 WOD AF-20R Premium Grade General Purpose Heat Shield Resistant Aluminum Foil Tape - Good for HVAC, Air Ducts, Insulation (Available in Multiple Sizes): 4 in. wide x 50 yds. WOD AF-20R Aluminum Foil Tape is a 2 Mil dead soft premium grade Aluminum Foil coated with an extremely aggressive synthetic rubber adhesive that provides a tight positive grab when smoothed on work surfaces; its malleable foil conforms well to irregular and curved surfaces. The WOD AF-20R Aluminum foil tape is an all-weather general purpose used in fiberglass duct board systems (on seams and joints to maintain the integrity of the vapor barrier) and on FSK systems. For heat reflection and dissipation - Masking in paint stripping and electroplating - Cover over and seal seams in Hexayurt shelters - Waterproof sealing - Sealing plastic and automation plateware (in biotech research). • Tensile Strength: 17.1 lbs/in. Ideal #488; Polyken #337; Venture #3530; Shurtape #AF973; Fasson #0802; Tesa #53900. USES AND APPLICATIONS - WOD AF-20R Aluminum Foil Tape uses include general repair, sealing hot and cold air ducts (excellent HVAC tape), duct insulation systems, sealing aluminum, stainless and plastic seams / joints, temporary repair of metal surfaces, copper pipe fixing, protect and extends durability to a HEXAYURT SHELTER or HEXAYURT TAPE. WILL BE CAPABLE - Good for indoor and outdoor where it is capable to resists flames, moisture / vapor, UV degradation, odor, weather, some chemicals and smoke transmission. Chemically resistant and heat and light reflective. ADHESIVE - Our tape is Premium grade Aluminum Foil coated with an extremly aggressive synthetic rubber adhesive that provides a tight positive grab when smoothed down on work surfaces; removable paper liner. PEACE OF MIND SHOPPING 100% MONEY BACK GUARANTEE! - We sell Good Quality Aluminum Foil if you are not satified, we will do our due dilligence to make sure you are completely satisfied with the product and service. Just send us an email, and we promise to make it right!